I originally asked for help in this post:viewtopic.php?f=32&t=27105 but thought I should post my own solution since I was having a slightly different problem and what worked for those individuals did not work for me. When connected to the FTDI board which was in turn connected to the computer via USB I would get eight blinks from the LED by pin 10 and the red LED would remain illuminated. I clicked upload on the IDE the Arduino Pro Mini would reset, LED by pin 10 would blink a couple times, then TX red LED on FTDI board would flash three times. The result would always be these errors. I quickly started to believe the problem was with my FTDI board, PC, or settings so I used the tests below to elliminate those variables. then connecting the FTDI via USB to you computer. Then run the Arduino IDE and open the Serial Monitor. Enter a character in the input textbox and click "send". If the FTDI board is working and drivers and settings are correct you should see your input echoed in the textbox below. So I happen to have an Arduino Uno handy and this really saved my behind. Since I never had any issues uploading sketches to the Uno at any point during this headache Sparkfun tech support suggested I attempt to upload a sketch to the Uno using my FTDI board. I was hesitant at first thinking the Uno required 5v and the FTDI board that I had only supplied 3.3v. To my surprise, it worked! open the Arduino IDE and selected the correct COM port and Board (Uno in this case). This next step is important because I did not connect the RESET between the FTDI and Uno. When I clicked on upload i watched the FTDI board intently, when the TX LED (the red one and may be rather dim) flashed the first time I pressed the RESET button on the Uno. If all goes well you should successfully upload the sketch to the Uno. Both of the above tests proved my FTDI hardware, drivers, and settings were correct. That pretty much left me with the possibility of two faulty Arduino Pro Minis. Since the LED activity on the Arduino Pro Minis appeared to indicate the hardware was functioning correctly I turned toward troubleshooting the bootloader. **SOLUTION** Reinstall the Arduino Pro Mini Bootloader using my Arduino Uno as an ISP Programmer! 5. Upload the sketch. 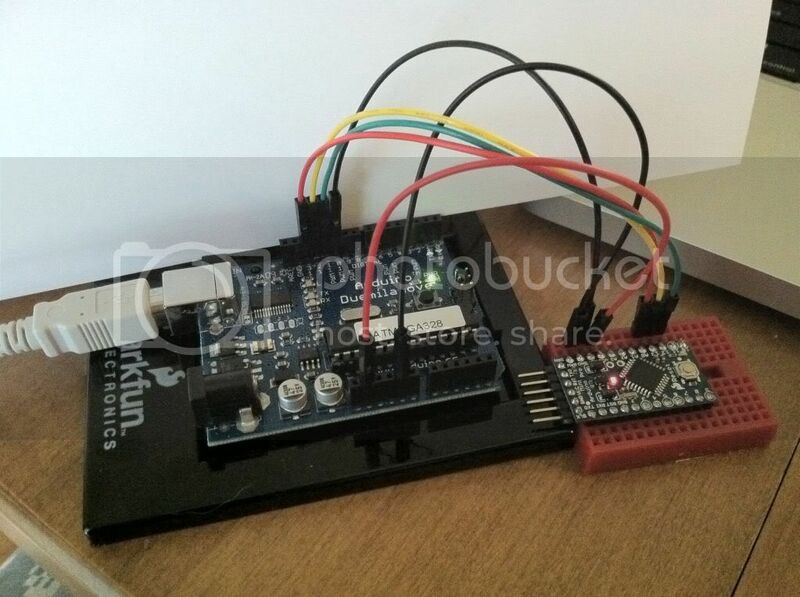 once complete your Arduino Uno is now programmed to be an ISP programmer. This is great because I really didn't want to buy a seperate programmer. This was a magical moment for me. All kinds of LEDS were blinking and flashing. After a few seconds the IDE said: Done burning bootloader, thank you. If this is also your result you have successfully reinstalled the bootloader on you Arduino Pro Mini. Next, connect the FTDI board to the Arduino Pro Mini and attempt to upload a sketch. I was so excited that this worked I let my wife sucker me into going to the arts and crafts store so she could buy some new sewing thread. Don't fall for this. 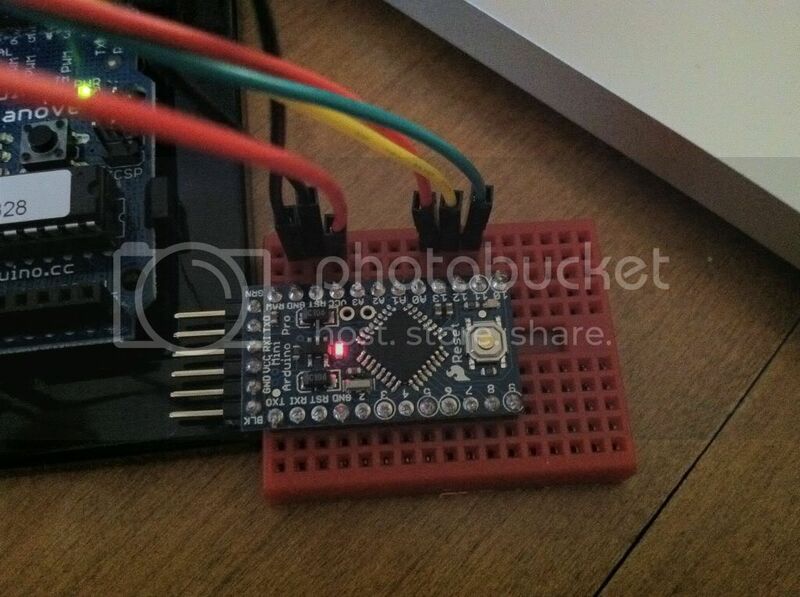 Every sketch I have uploaded to my Arduino Pro Minis has been successful form this point on. The end. I bought 5 pro-minis 3,3v/8mhz at german reseller Watterott, the first i used worked perfectly, the next two refused upload with this error. After using an uno and writing new standard-bootloaders via arduino-ide everthing is perfect. This seems to be a general error in some (newer?) pro-minis. I am having the same problems with my 3.3v Pro Mini's. Any ideas what the problem could be? Do I need an UNO? Interesting. Do you have a theory as to why reloading the bootloader fixed the problem? whompalompa wrote: I am having the same problems with my 3.3v Pro Mini's. How far are you able to get in the process? Do you get these errors when uploading regular sketches to the duemilanove? JChristensen wrote: Interesting. Do you have a theory as to why reloading the bootloader fixed the problem? I'm certainly no expert on the bootloader so I don't really know what was wrong. However, I do remember reading somewhere in the sea of posts on this topic that some bootloader versions where not waiting long enough after power on or reset to determine if data was coming in on the serial input. Since it wasn't waiting long enough, communication could not be established to upload sketches which caused our errors. Like I said, I don't know for sure if this was the issue but it gave me the idea to try reinstalling the bootloader. whompalompa wrote: Any ideas what the problem could be? Do I need an UNO? I dont think so, but maybe you need a specific version of the arduino sdk and the included arduino-isp.pde, I am using arduino-22. Thanks so much for posting your solution. I am just in the process of moving a project from a Uno breadboard to its final (i hope) form on a 3.3v pro mini and I encountered this problem. Fortunately, I didn't have to follow (and probably couldn't have followed) your difficult troubleshooting path. I just followed your quite clear instructions and PRESTO! Also, I learned something about methodical troubleshooting. That's what I love about boards like this and the Arduino universe: lot's of helpful folks out there. I have a Duemilanove and get the same error. It did upload successfully to the Duemilanove, but when I select "Burn Bootloader" I get the avrdude: stk500_getsync(): not in sync: resp=0x15 error. Thoughts, anyone? Before you select burn bootloader are you changing the target board from duemilanove to pro mini? I thought this step was a bit counter intuitive but you are burning the bootloader to the pro mini, not the diemilanove. Can you take a picture of your wiring so we can see how you have it set up? After doing this, you should be able to follow rubinoae's instructions to install the proper bootloader on your 3.3V Pro Mini.